Has someone you have only met online asked you to send them sexual photos and/or videos, or perform sexual acts via webcam? Is this person asking you to keep your contact secret, threatening to post the photos or videos of you on the internet or share them with your friends and family if you don’t send more or pay money? 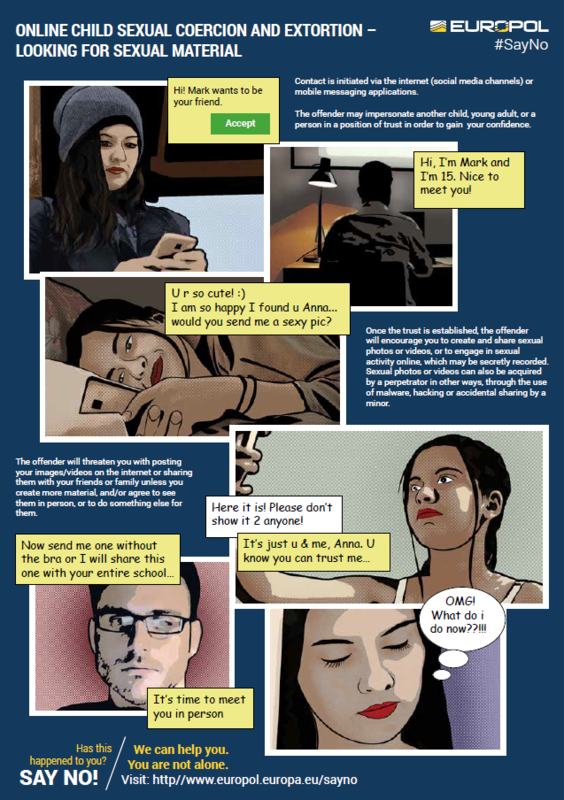 This is a crime – it is called online sexual coercion and extortion. If this happens to you: #SayNo! Look for help. Tell a friend or an adult you trust or report it to the police. You are not alone. 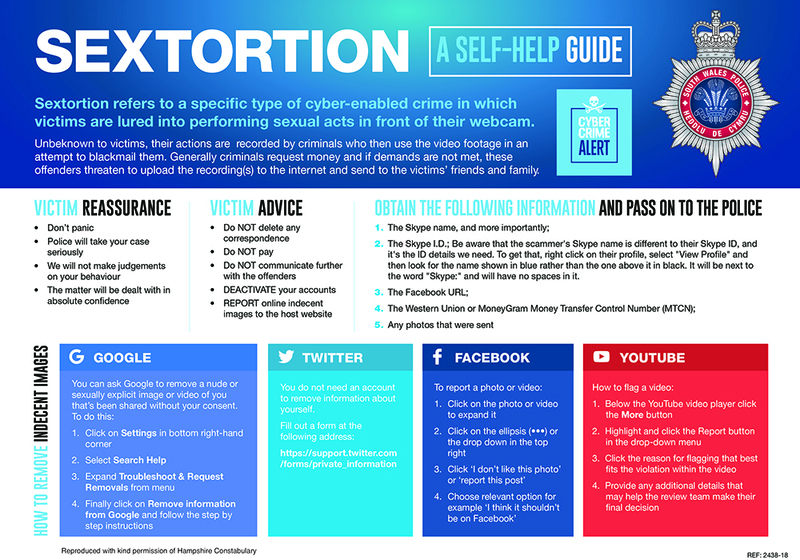 Offenders may try and approach you online to get sexual photos or videos of you. To achieve this, they will try to make you feel special by pretending to be your friend. They might say nice things to you to gain your trust. They may also lure you into sexualised conversation and performing sexual acts online. Once they get hold of your sexual photos or videos, they may demand you send more, or ask you for money, threatening to post the images on the internet or share them with your friends and family if you don’t do as they say. They can be very clever at making you feel guilty about what has happened to stop you from getting help. Although this behaviour can also exist in a peers’ environment, this advice focuses on criminal activities conducted by adults. This person is not someone you should trust. This is an offender and should be prosecuted. Many victims don’t seek help or report it to the police as they are embarrassed about the material the perpetrator has, or because they are unaware that they are victims of crime. Don’t panic. Contact police and your internet service provider immediately. Police will take your case seriously, will deal with it in confidence and will not judge you for being in this situation. Don’t communicate further with the criminals. Take screen shots of all your communication. If it has happened via Facebook, suspend (but don’t delete) your account and follow the steps above. Deactivating the Facebook account temporarily rather than shutting it down will mean the data are preserved and will help police to collect evidence. The account can also be reactivated at any time so your online memories are not lost forever. Also, keep an eye on all the accounts which you might have linked in case the criminals try to contact you via one of those. Don’t pay. Many victims who have paid continue to get demands for higher amounts of money. In some cases, even when the demands have been met the offenders will still post the explicit videos. If you have already paid, check to see if the money has been collected. If it has, and if you are able, then make a note of where it was collected from. If it hasn’t, then you can cancel the payment –the sooner the better. Preserve evidence. Make a note of all details provided by the offenders, e.g. the Skype name (particularly the Skype ID), the Facebook URL; the Western Union or MoneyGram Money Transfer Control Number (MTCN); any photos/videos that were sent. Be aware that the scammer’s Skype name will be different to their Skype ID, and the ID details are what police need. To get that, right click on their profile, select ‘View Profile’ and then look for the name shown in blue rather than the one above it in black. It’ll be next to the word ’Skype’ and will have no spaces in it. DO NOT DELETE ANY CORRESPONDENCE. Remember, you’re a victim of organised criminals. You are not alone and confidential support is available. You can get through this. An economic interest, where the objective is to gain financially from the extortion. The ‘Say no’ campaign was launched by Europol in June 2017. For an updated overview of the campaign, please visit the Europol website. For free, confidential advice and support, contact Samaritans Cymru. Disclaimer: Key content on this page has been drawn together from the UK NCA CEOP Commands education programme which specifically addresses the risk of online child sexual abuse and exploitation via their Thinkuknow website for children and young people.